Tuna is simply a contemporary body text font. It is contemporary, meaning the merge of charming broad-nibbed calligraphic style with optimized readability on screen—showing that the roots of writing and typesetting are still in charge when reading “Anna Karenina” on a kindle till 4 o’clock in the morning. With more than 700 glyphs in 10 styles created with a maximum of consideration, it has all the qualities of a modern OpenType font serving the needs of todays communication. A steep pen-angle is a design feature that was much more pronounced with the ancestors of todays serif typefaces. The calligraphic models such as the “Roman Rustica”, the “Half-Uncial” or the “Carolingian minuscule” have all significantly slanted pen angles—some even steeper than 45°. With the spread of the printing-press during the following centuries, writing angles became far less slanted, finally ending in an nearly perpendicular axis during the classicist period in which the similarities of letterforms were emphasized. This development was seen in a critical light in later years. The objection was that François Ambroise Didot the famous french printer had pushed the art of printing and cutting letter to a destructive ultra-perfection. Studies of that time led to the insight that these developments did not necessarily contribute to enhancing readability. A second source of inspiration was Roger Excoffons extraordinary draft “Antique Olive”. There are many articles about type-design that mention the horizontal elements of a typeface – for example the serifs – as being an important part of a good text typeface; they enhance the ability of the reader to track the line of type. Nevertheless, we were impressed by the good legibility of sans serif typefaces that emphasize horizontal elements (for example “Balance” by Evert Bloemsma, “Signo” by Rui Abreu or “Laika” by Jens Gehlhaar). In the context of screen-optimizing, the idea of a weight shift in favor of the horizontal is given special relevance – the same line widths in the vertical and horizontal elements of the font can be mapped perfectly on a rasterized grid. How it works? Each writing tool creates characteristic shapes. Tuna’s shapes—by a broad nib pen with steep angle—fit best, because vertical and horizontal strokes are almost equal. The reading of longer texts on a screen has become an everyday issue—in the subway you’ll recognize the winner in the fight digital versus paper. Web Fonts are completely established, more and more content is offered for reading on tablets or mobile devices. For this reason, demands on typefaces for that field of use have grown steadily. As mentioned above, we worked with ancient writing principles during the design process, aiming to fulfill the needs of a contemporary typeface. 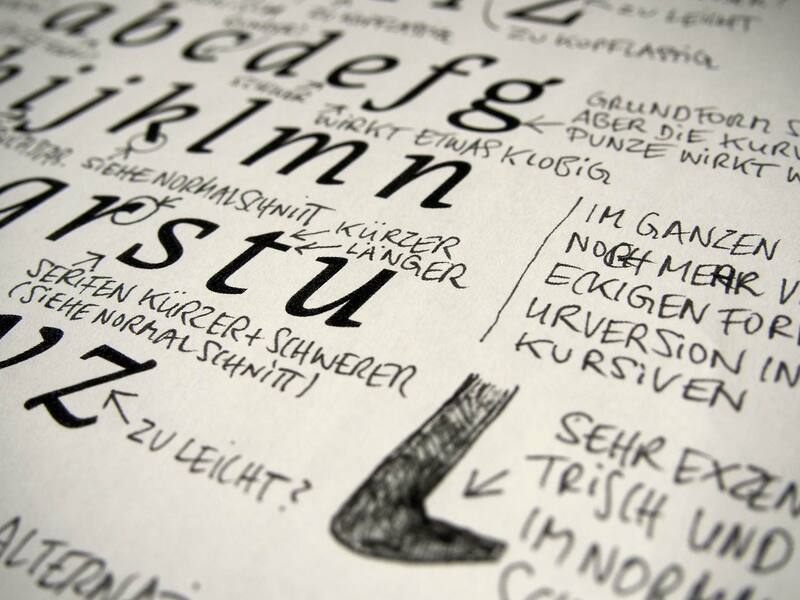 Despite that fact, most typefaces were not especially designed for a digital environment. Often it’s a post-design task to improve readability on screen using technical solutions such as Hinting. But screen-optimization has to start earlier. There were a few key-characteristics that we defined as our basic design rules to achieve extraordinary readability. Large counters and open letter forms with wide apertures increase legibility because they form distinctive shapes und therefore are important for individualizing the glyphs. 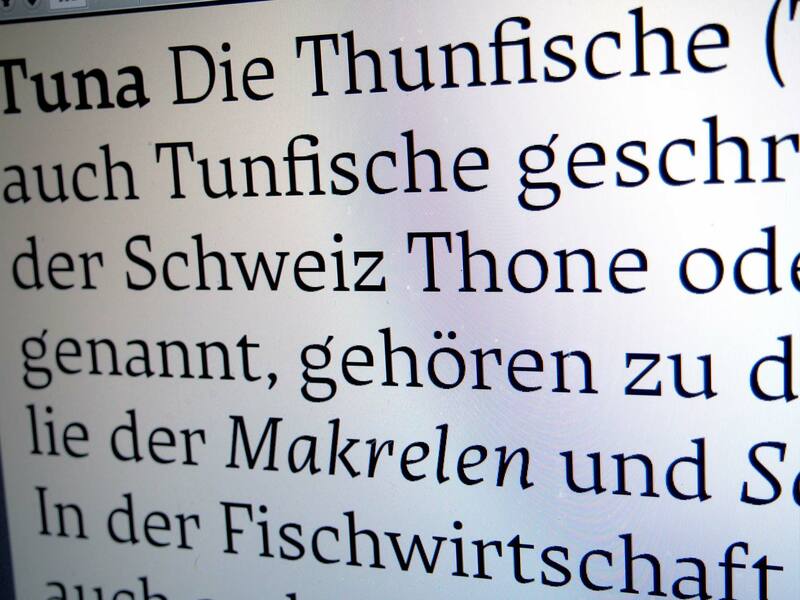 Tuna has also a generous x-height in comparison with the typeface’s ascenders and descenders. The increased x-height allows for adequate whitespace of the counter forms. This works quite simple: If characters are too similar you will have to re-read a word. If the word-image is not clear enough, it will simply take more time to read it; especially if it includes difficult candidates like uppercase ‘I’ and lowercase ‘l’. It was important to the design to keep the variety of glyphs throughout the whole character set. The more angular a curve is, the better it will fit into the pixel grid. So circular forms are taken as close to the edges as possible. Obviously that leads to a bigger counter form inside. A common problem concerning a typefaces display-qualities are thin lines and small punches. 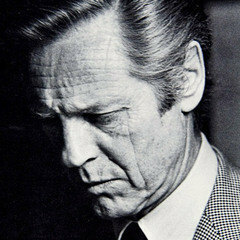 Hairlines tend to disappear at smaller sizes or under bad conditions, for instance a newspaper-print or on illuminated screens. Characters seem to fall apart into segments. Low stroke contrast will solve that problem. This attribute is mainly associated with sans-serif typefaces, but could be integrated in a serif design too—even combined with a calligraphic touch. 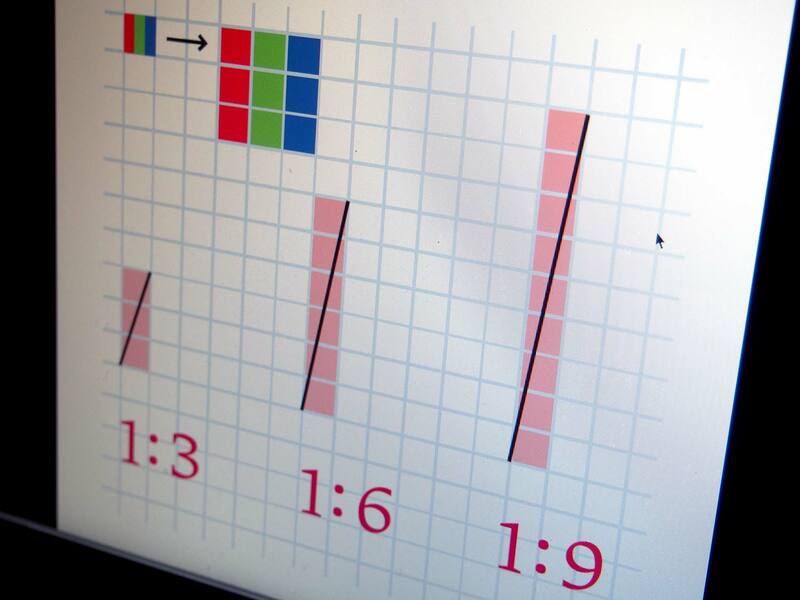 Angles with a ratio of whole numbers have a better reproduction on screen because they relate to the pixel grid. In the first step we went slightly too far in the way we were forcing the letter strokes into grid. The letters turned out to be static and uniform. So we decided to take a little more of a relaxed stance to the paradigm of rational angles. Too many details blur the appearance in common reading font sizes; they interfere with the basic letter form, which is important for identifying the character quickly – simplicity works to benefit the word image. Tuna has a manually optimized TrueType Hinting and was improved especially of the use of font sizes between 9 point and 14 point. On screen, however, the letterforms have to be translated into pixels in a more or less coarse grid. Font hinting is a process by which letters are adjusted individually in different sizes to line up with a rasterized grid. Improving the quality in low screen resolutions, hinting is critical for producing clear, legible text. For each letter specific instructions can be stored, as the character is to be displayed in a specific font size on the pixel grid. During font-hinting, the consistency of letterforms is often sacrificed by changing the outline, aiming for better readability. As a result the outlines look quite different in different sizes and may differ from the original letterform. Tuna takes the opposite approach: The letterforms use various design features—as listed above—to avoid classical “danger zones”. The rendering of hairlines, for example, needs no corrections if they are already strong enough. Because of that no changes to letterforms are needed even at small sizes, and the character of the font is retained and stays very much the same in any environment and size. Nevertheless, we did not rely on automatically generated hinting. 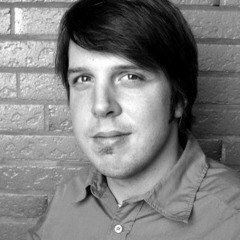 We put the hinting process in the hands of Jan Gerner (Yanone), who did a really good job. Tuna was optimized especially for ClearType and DirectWrite (the glyph rendering API of Microsoft). The family comes in five weights: Light, Regular, Medium, Bold and Extrabold. All weights can be combined with each other, but during the design process certain weights were adjusted to each other. Tuna Regular is matched to Tuna Bold, Tuna Light was paired with Tuna Medium and Medium with ExtraBold. So if you for example want to stress one word in a text set in Tuna Regular, use Tuna Bold in combination. The different weights were interpolated from two poles. The intermediate steps were calculated based on Luc(as) de Groot's interpolation theory. According to this formula (B=√(A÷C)), which generates a exponential increase, the weights can be clearly distinguished optically from each other. Despite the logic of that theory, the purely mathematical calculation led to too little differentiation within the light weights and extreme results in the stronger weights. Therefore Tuna follows an adjusted and slightly flattened interpolation curve. 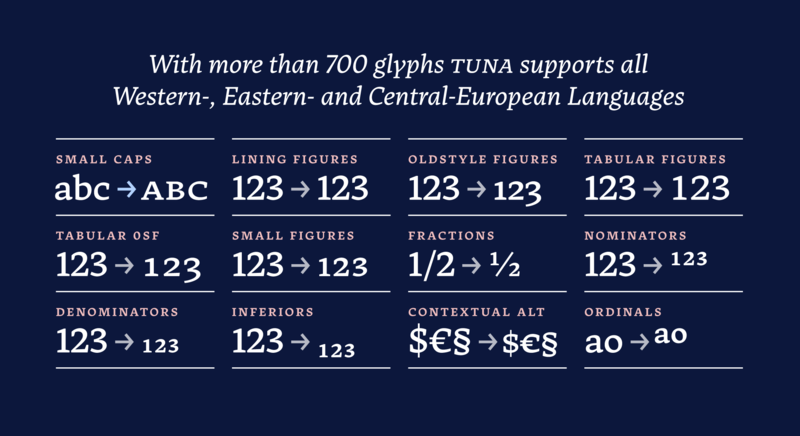 Besides that fact that Tuna offers Small Caps, various styles of numerals and mathematical signs as well as common currency symbols, it has a wide range of language support. To meet the needs of global communication, Tuna supports all Western, Eastern and Central-European languages. 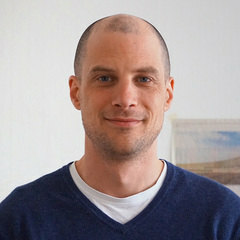 The type design was hammered out in a 3-year ping-pong like collaboration of the type designers Felix Braden and Alex Rütten. The design went through a lot of changes over the times—some regarding the whole design itself others concerning details. Especially when you’re working on a type design project, which can take a little time it is a great benefit to get a second opinion on your work. Otherwise you easily loose the necessary distance to what you’re currently working on. Of course you have to be open for solutions, that may be not always your first choice, too. So the whole process took place in a close dialog with each other, focussing on screen optimization, readability for long texts and the formation of a distinct character for use in headings. The first draft was drawn and revised by hand to give the font a natural, almost written character. Unlike most humanistic fonts the basic forms were developed in a drawing process on the computer. The basic letter forms were drawn with a very wide broad-nibbed pen and then digitalized. In that state it had a rather 50’s style look and we both agreed in the point that it looked a little bit stiff—to be honest. 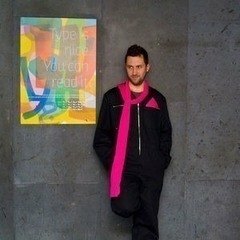 Thats why we added more individuality and funkyness in the next design step. Repeating and static elements were taken out and superseded with vivid details and seemingly organic elements added asymmetrical rounded serifs and calligraphic verve, resulting in a friendly, modern font with plenty of energy, which remains functional and performs exceptionally well on screen. But the basic design skeleton didn’t change so much. Also the amount of glyphs within the character was growing in that period of the process. All the numerals were generated with RMX-Tools, OpenType Features were added and then of course the kerning had to be done too. Then finally we generated the fonts from the multiple-master file and handed it over to Yanone, who to our surprise directly reacted to our email request. He quickly started adding the hinting instructions. And then it only took a litte time and the final fonts were generated.